With battery life still struggling to accommodate the needs of heaviest smartphone users, reducing charging times is the next best thing. 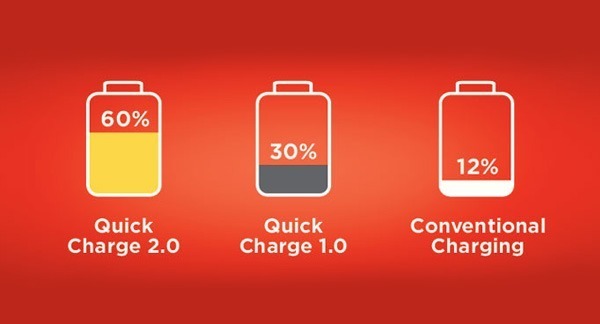 Qualcomm’s Quick Charge technology aims to do just that. The latest 2.0 version boasts up to 75 percent faster charging times than standard devices and HTC states that using the Rapid Charge 2.0 adapter states, you can charge your smartphone to 60 percent in just 30 minutes. Quick Charge 2.0 is built in to all of Qualcomm’s latest SoCs, meaning that most of us should be able to benefit from faster recharge speeds. However, can you expect such impressive sounding battery charge times in all situations? Before we begin, a quick note on batteries in general. Essentially, batteries are charged by the current delivered to them by the power source. Applying additional current at a set battery voltage results in more power, which can result in faster charging but also requires sturdier charging components that can withstand high power levels. Different amp specifications on different charging adapters alter the time it takes to charge your phone, but there’s a maximum limit to how much current can be pushed through. Receiving devices, such as smartphones and tablets, include regulator circuits that will limit the charging current to prevent too much power dissipation and therefore potential damage. Charging sources, such as mains adapters, take mains power and convert it into a form that usually doesn’t exceed the maximum specifications of the device being charged. With smartphones, your adapter takes a high-voltage AC supply and converts it to 5 volts DC with a maximum amount of current draw. Qualcomm’s Quick Charge 1.0 technology was designed to maximise charging efficiency for up to 10 watts of power, by allowing for a maximum current draw of 2 Amps through a standard USB adapter and port voltage of 5 volts. Quick Charge 2.0 allows for an even higher level of power transfer between your power source and smart device, up to a maximum of 36 watts in certain scenarios. Qualcomm splits its 2.0 technology into two classes, A and B. We’re most interested in Class A, which applies to smartphones, tablets, and other portable electronics. The specifications for Class A allow for a maximum charging current of 3 Amps, depending on the source. Your typical smartphone charger will run at 5 volts, drawing 3A of current boosts Quick Charge 2.0 up to 15 watts of power. This means that you can draw more current from a traditional 5 volt USB supply, thereby speeding up the charging time. Class A devices will also work with 5, 9, or 12 volt supplies and can therefore tolerate more power. The range of higher voltages means that a single charger can work with a wide range of devices and also ensures high quality performance by reducing the impact of any voltage losses that appear over long cable distances or poor quality cables. Qualcomm’s Quick Charge 1.0 and 2.0 technologies are also backwards compatible with one another, meaning that you can use a 2.0 devices with a 1.0 supply, or a 1.0 device and 2.0 supply and get your 2 Amps. However, only a 2.0 device and compatible 2.0 charger will allow for 3 amps of current and higher power ratings. Despite the promised speeds and current capabilities, there are some limitations imposed by the USB standard itself. The commonplace USB 2.0 standards deliver just 0.5A of current, while newer USB 3.0 ports bump this up to 0.9A and also lays out a specification for dedicated charging ports which can provide 1.5A of current at 5 volts. Although you’re unlikely to find many home computers making use of this. You may have noticed that this doesn’t max out Qualcomm’s latest specification and that charging speeds will depend entirely on which ports your computer or laptop has. You also won’t notice a difference in charging speed from your laptop between Quick Charge 1.0 or 2.0, as USB ports can’t yet reach 2 amps of current. Qualcomm’s Quick Charge 1.0 and 2.0 both allow users to grab the most current possible from standard computer USB ports, but you can’t bypass the limitations imposed by the source. If you want even faster charging, you will still need to connect up to the mains. Why do I need a new power adapter? If you check the current rating of the mains adapter that came with your smartphone you will probably find that it is rated anywhere between 1 and 2 Amps, depending on its age. Quick Charge 2.0 can juice up from a maximum of 3A, so you will need a mains plug source capable of outputting a higher amount of current than your typical phone charger to make full use of the technology. Quick Charge 2.0 will technically work with any USB adapter capable of outputting 3A or more at 5 volts and will simply limit the current to the maximum allowed. As we said before, Quick Charge 1.0 handsets will be limited to 2A even from a 3A mains plug and other smartphones will have their own lower limits too. Other phone’s won’t necessarily work with higher current adapters or other cables, as they can be fooled into thinking they are connected to USB rather than the mains and limit their own charging speeds. This isn’t a problem with Quick Charge enabled devices. Various smartphone manufacturers each have their own adapters aimed at improving charging times, but the truth is that these are mostly cross-compatible. Motorola’s Turbo Charger and HTC Rapid Charger are essentially both just offering up 3 amps out of the wall at 5 volts, and will work with any Qualcomm smartphone with Quick Charge 2.0 technology. The key point to look out for is that both chargers list Qualcomm’s technology specifically, so you won’t have to change chargers if you buy a new smartphone. Don’t worry about the branding, Quick Charge 2.0 adapters are universal. While there is currently only a small selection of Quick Charge branded adapters, the technology is actually rather universal and you can make use of quicker charging times providing that you have a compatible smartphone and a charger capable of supplying enough current. As Quick Charge 2.0 is a feature of Qualcomm’s Snapdragon 800 series of SoCs, pretty much every major flagship smartphone will be supported. The recently announced HTC adapter will technically work with any and all of the Quick Charge 2.0 and 1.0 enabled smartphones. You can double check for support on Qualcomm’s official website under your smartphones specifications.